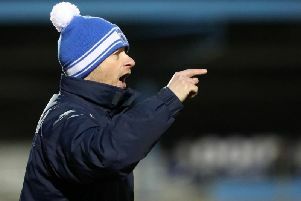 Gareth McConaghie fired home a spectacular free kick 17 minutes from time to give Rodney McAree his first win as Coleraine manager. Darren McCauley challenges Sean Ward. The big defender blasted the set piece in from the edge of the box to make it two wins in two games over Crusaders this season. It was a hard fought victory for the Bannsiders but the sense of relief was there for all to see at the final whistle. James McLaughlin started his first competitive game for Coleraine since the 2017 Irish Cup final. But unfortunately for the big striker his comeback lasted on half an hour as he limped off dejectedly with what looked like a hamstring injury. Coleraine made a bright start with Ciaron Harkin finding space in behind the Crues defence on six minutes, but his pull back evaded Josh Carson at the back post. The hosts almost gifted the visitors a goal two minutes later as Gareth McConaghie left Mark McChrystal's long ball allowing Paul Heatley the chance to nip in, but he could only direct his header over the bar. Chris Johns was forced into action on 26 minutes as Heatley broke down the right, he squared for Rory Patterson, but the Coleraine keeper got down well to palm away the shot. Crusaders had the ball in the net on 41 minutes as Kyle Owens bundled home from close range after Heatley had crashed a volley off the underside of the bar. The goal was chalked off though for offside though. Coleraine went close to a goal right on half time as O'Donnell's header was deflected wide. The home side had to make another change at the start of the second half with Alex Gawne replacing the injured Aaron Burns. And the 17-year-old made an immediate impact forcing Sean O'Neill into a save. Mark McChrystal found himself in the referee's notebook after bringing down the pacey young forward. Coleraine's dominance paid off as they edged in front on 73 minutes - and what a strike it was. Gareth McConaghie stepped up to drill home a low shot after the Bannsiders were awarded a free kick on the edge of the box. Coleraine were looking dangerous on the break as the Crues pushed for an equaliser. Howard Beverland did well to block a McGonigle effort after a swift break forward on 78 minutes. The Crues thought they had pulled a goal back just before full time as David Cushley lashed a shot from the edge of the box, but Johns got down well to palm it away for a corner.